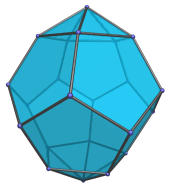 The parabiaugmented dodecahedron (J59) is the 59th Johnson solid. 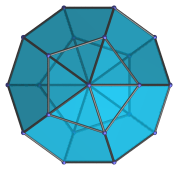 It has 22 vertices, 40 edges, and 20 faces (10 pentagons and 10 triangles). It can be constructed augmenting a dodecahedron with two pentagonal pyramids on opposite faces. 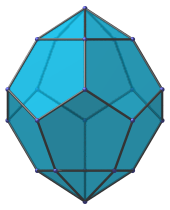 If one of the pentagonal pyramids is removed, the result is the augmented dodecahedron (J58). 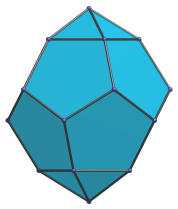 If the two augments lie on pentagons separated by an edge instead of opposite pentagons, the result is the metabiaugmented dodecahedron (J60).